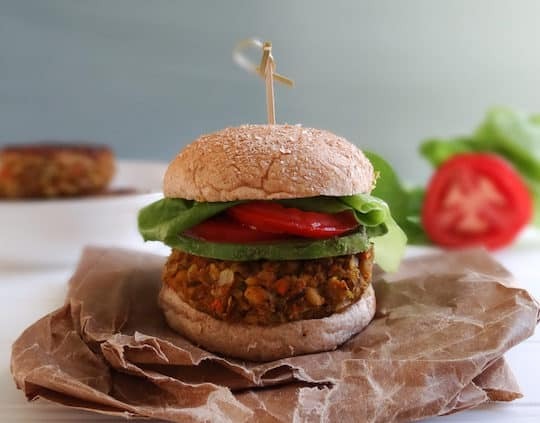 Here are a dozen tasty and healthy vegan farro recipes. This nutty, hearty grain has joined other recently revived ancient grains like quinoa, einkorn, kañiwa, and teff in the modern kitchen. Filled with fiber and high in iron, you’ll want swap it in for rice and barley in all kinds of dishes. 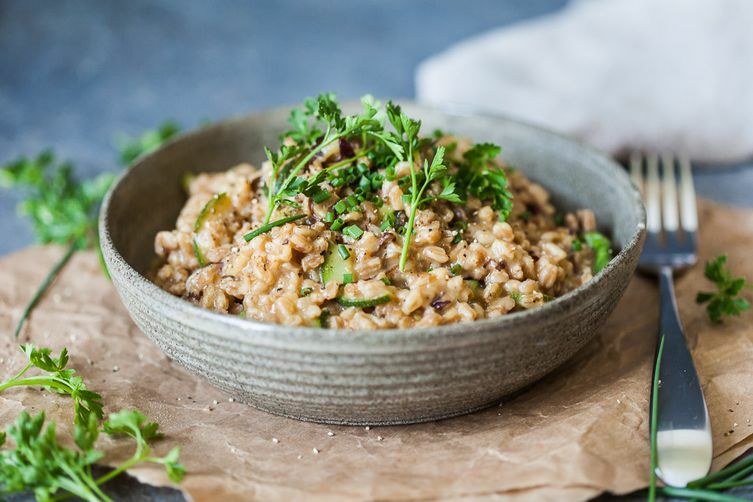 Make sure to see our guide on How to Cook Farro for more tips, and be inspired by the recipes ahead. Super-Quick Grain-Stuffed Peppers (shown at top): Once you stuff the pilaf into prepared peppers, you need not even cook or bake them any further. 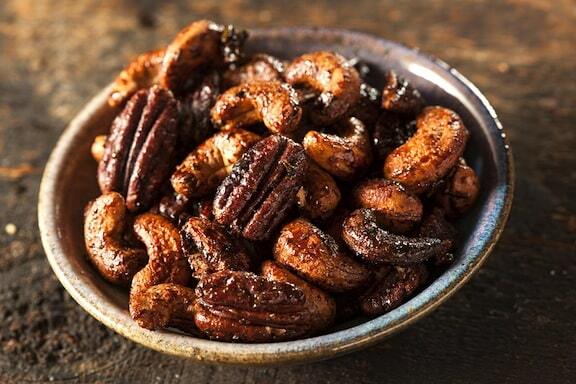 For these, we used a delicious porcini-flavored quick-cooking farro pilaf mix, for those of you who are in a hurry. 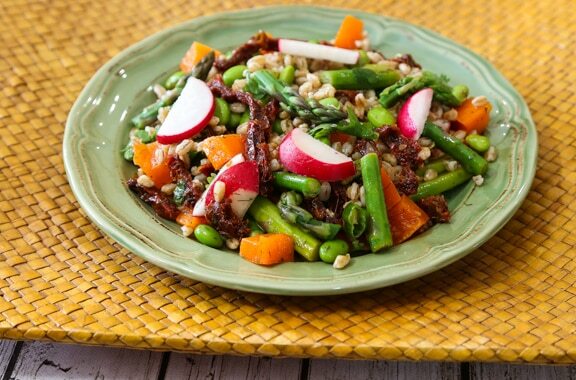 Spring Farro Asparagus Salad: A delicate blend of the farro, asparagus, radishes, edamame, and peppers, this is good served as a side-by-side entrée with a warm or cold bean dish. Leftovers are excellent for the next day’s lunch for home or work. Artichoke Farro: Farro is a favorite grain in Italian cuisine, so it’s a natural partner for artichokes—another Italian favorite — in this simple pilaf by Kim Lutz. 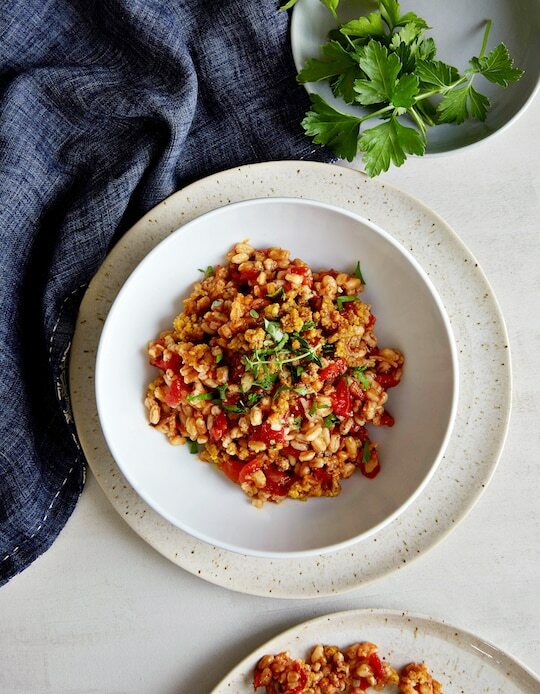 Baked Farro with Tomatoes & Herbs: Contributed by Isa Moskowitz and Terry Romero, this comforting and easy tomato and herb-drenched baked farro casserole may bump your favorite pasta bake down a notch or two. 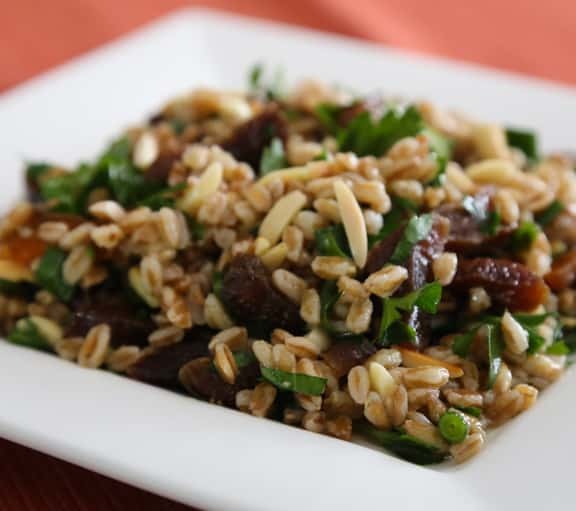 Barley or Farro Salad with Apricots and Almonds: Here’s a simple Middle-Eastern inspired salad whose slight sweetness makes it a good foil for other Middle Eastern specialties like hummus, tabbouli, and baba ghanouj. 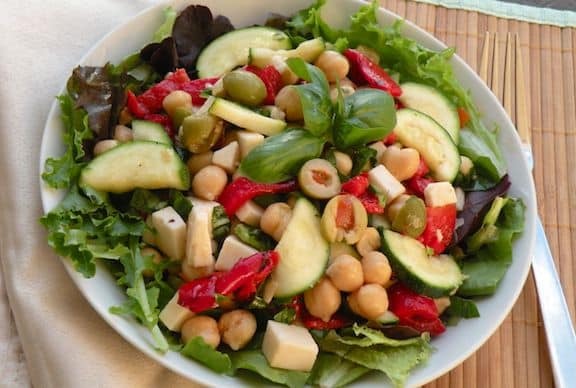 Mediterranean Farro Salad with Spiced Chickpeas: A recipe from Budget Bytes, this salad features a classic tomato and cucumber combo, seasoned and sautéed some chickpeas. 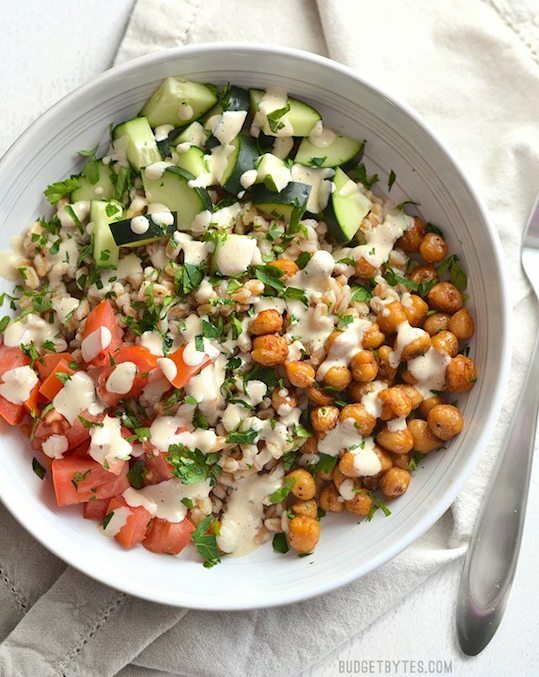 It’s topped it off with a creamy tahini dressing. 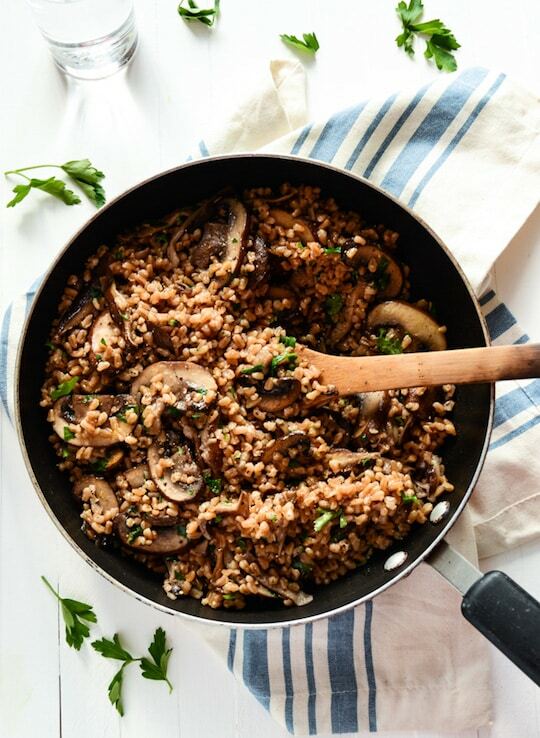 No-Fuss Garlicky Farro with Sautéed Mushrooms: From Blissful Basil, this farro dish is super-easy, with minimal chopping, cookware, and ingredients required. 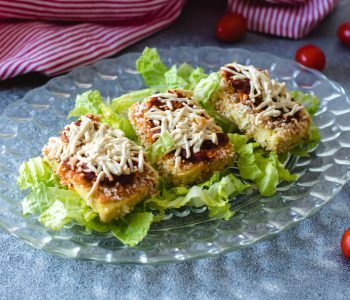 It’s a comforting kind of main dish you’ll love at the end of a busy day. Vegan Farro Risotto: This risotto-style creation is by Food 52 contributor Vibrant Plate. Embellished with leek, carrot, and zucchini, it makes for a simple and satisfying dinner entree. 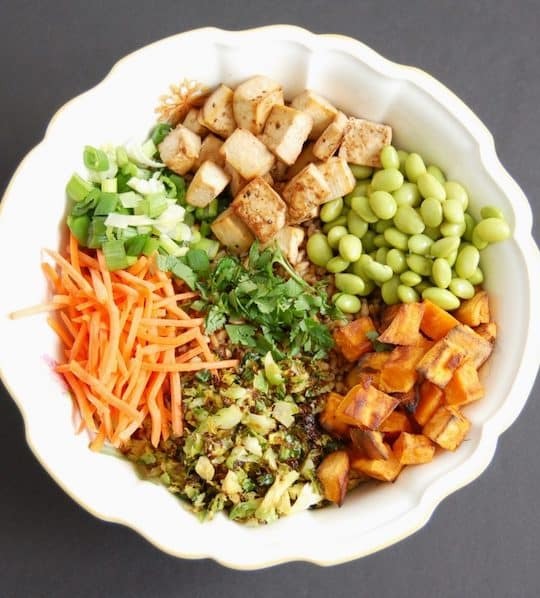 Asian-Style Farro Buddha Bowl with Crispy Baked Tofu from Small Bites helps you stick to your healthy eating goals! 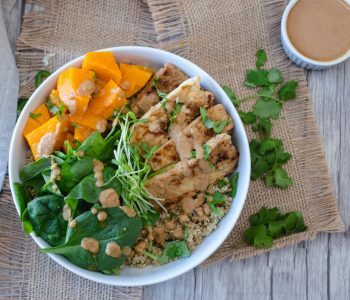 This Farro Buddha Bowl is packed with veggies, protein, and Asian-inspired flavors. 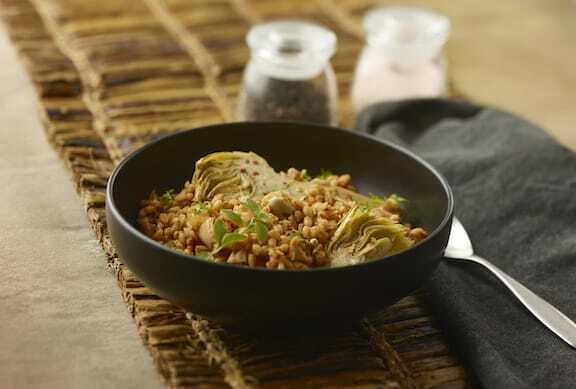 Vegan Farro Mujadara is an inspired idea from rom Whisk and Shout. 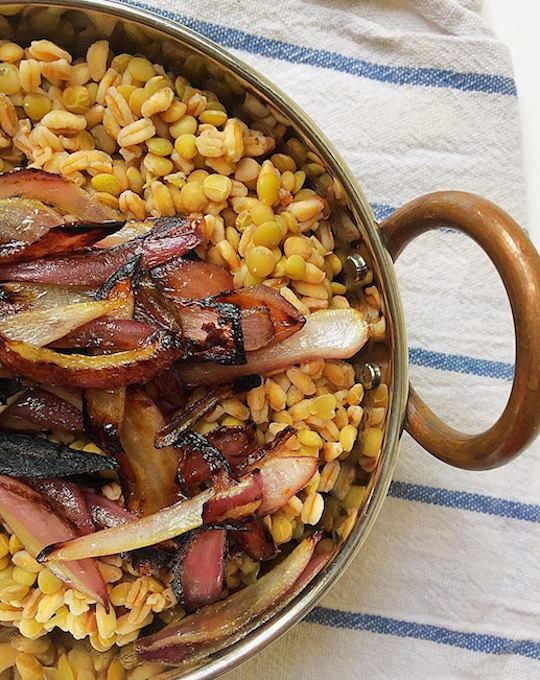 The Middle Eastern classic combines lentils with either rice or bulgur; so why not try it with Farro? It becomes heartier than ever. 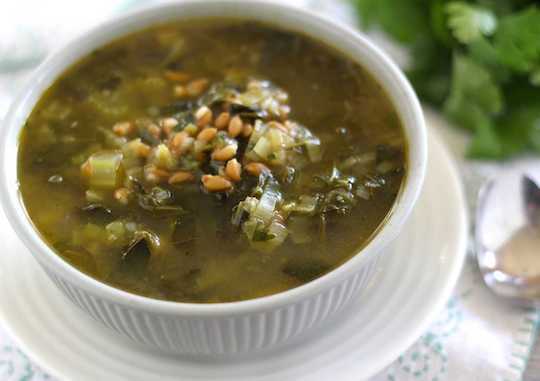 Farro and Hearty Greens Soup: Finally, from Letty’s Kitchen, this savory farro and hearty greens soup is a delicious cold weather favorite of Letty’s family, and she’s betting that you’ll love it as much as they do. 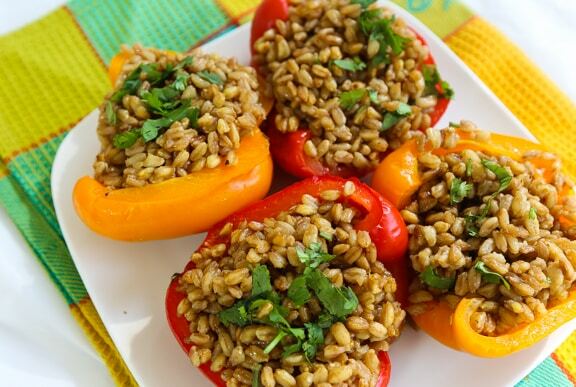 What a fabulous collection of vegetarian farro recipes! I Pinned every one! Thank you for including my farro and greens soup. Thanks, Letty! Yours are fabulous, too. I’ve never really gotten into cooking with farro before, probably because I didn’t really know much about it. But that just changed thanks to your great recipes, especially the one with artichokes that sounds delicious. I’m def going to try them out, thanks!